The elbow ligaments help to keep the elbow stabilized during activities, and to provide feedback to the muscles. The ligaments of the elbow are comprised of the ulnar collateral ligament, the radial collateral ligament, and the annular ligament. Injuries to the elbow can often involve the ligaments, espcially the ulnar collateral ligament. This type of injury is very common with overhead throwers, especially pitchers. The ulnar collateral ligament (UCL) is the primary medial stabilizer of the elbow. Of the elbow ligaments, it is the most commonly injured. It runs from the medial side of the humerus to the ulna, and is composed of two bands. The anterior band, seen in the picture, is the ligament that is injured with UCL sprains. Ever heard of Tommy John surgery? This is the ligament that is torn, and subsequently reconstructed during this procedure. Injury to the UCL can be caused acutely, or can be degenerative over time. Overhead throwers can be affected, since they place a great amount of stress on the medial side of the elbow. The posterior band of the UCL is not as commonly injured in sports. 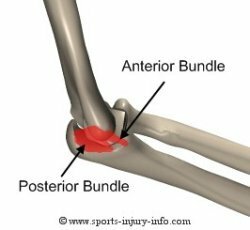 The annular ligament surrounds the head of the radius and attaches it to the humerus. It allows the radius to rotate, which enables you to turn your forearm, like when you turn a doorknob. Although it is not commonly injured with sports, it can cause problems and limit motion if the elbow is immobilized for long periods, such as after a fracture or after surgery. The elbow ligaments play an important role in stabilizing the elbow. 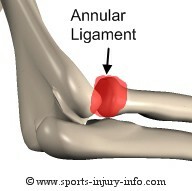 Ulnar collateral ligament injury is the most common injury to the ligaments. The ligaments attach the radius, ulna, and humerus, and help to prevent excessive joint motions.